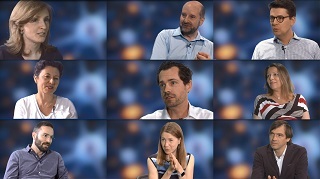 Nine scientists share their passion for neuroscience with lay interviewers in a video produced for the ZNZ BrainWeekend that took place September 8-9, 2018. This beautifully made video features interviews with Adriano Aguzzi, Patrick Freund, Paola Picotti, Luka Kulic, Magdalini Polymenidou, Theofanis Karayannis, Dominik Bach, Yulia Sandamiskaya and Bea Latal. It was produced for the ZNZ BrainWeekend, organized as part of the science fair “100 ways of thinking” of the University of Zurich.